Permanent changes to DNA sequences are called mutations. These changes mean the DNA sequence differs from others in the population. Mutations are often associated with genetic diseases such as genetic diseases and cancer, but are also a normal source of variation in the gene pool, contributing to natural selection. Mutations can have widely different consequences depending on their context. Mutations can spontaneously occur in most cell types at any time. Mutations that occur in the somatic cells (all cells excluding the sperm and egg cells) either during development or in adulthood will not be inherited by the next generation. Mutations in these cells will only be passed on to daughter cells dividing as part of normal cell division that occurs in tissues and organs in the body. 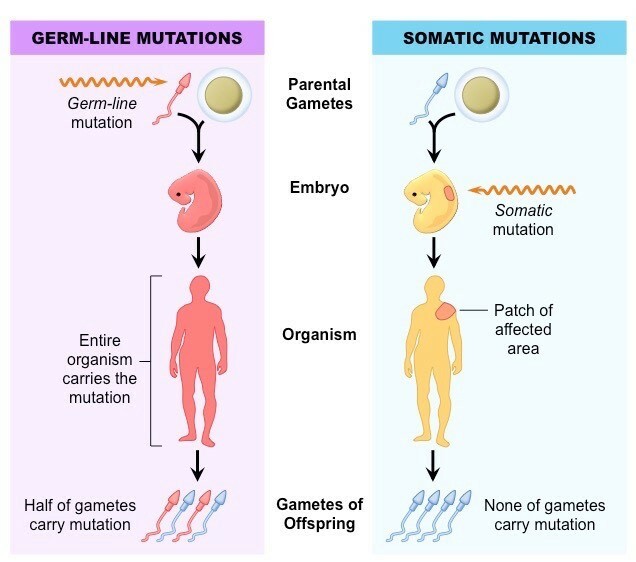 For mutations to be passed on to the organism’s offspring, they must occur in the parental gametes (eggs and sperm, also referred to as the germ-line), as these are the only cells that contribute genetic material to the offspring, and all the cells in the offspring are derived from gametes. Therefore, if the mutation is present in the gametes and passed on the offspring, all the cells in that individual will carry the mutation. Mutations can also occur during the development of sperm and eggs, resulting in a spontaneous mutation being passed on to the next generation. How and when do mutations occur? Mutations can occur as a result of a variety of factors, including exposure to certain chemicals or other environmental influences. Mutations can also happen as a result of mistakes in the cell such as errors during DNA replication or chromosome misalignment during cell division. Environmental factors include exposure to UV light from the Sun, or X-rays. UV light can cause mutations in skin cells and is why it is recommended to wear sunscreen when exposed to the sun. An accumulation of skin cell mutations can cause cancer. There are a huge number of known chemical mutagens that can modify the nucleotides in our DNA. Some examples include nitrogen mustard and alkylating agents. DNA replication is carried out by the enzyme DNA polymerase, which can sometimes make mistakes when copying DNA. This often happens at specific regions of the genome called “mutation hot spots” where the enzymes involved in DNA replication tend to make mistakes. This is often when the sequence is very repetitive, meaning the DNA polymerase loses its place and makes errors. Cells have developed mechanisms to sense large accumulations of mutations and DNA damage and can either repair the damage or initiate a cell death programme called apoptosis, to ensure mistakes are not passed on to the daughter cells during cell division. Mutations come in a variety of types. They can be small and have little to no effect on the organism. This could occur when the protein produced by the mutated gene is not largely affected by the change. However, mutations can also be large, affecting large regions of the gene, causing the translated protein to be faulty. Even small mutations can have large effects if the protein is strongly affected, for example, one change in a nucleotide could change the resulting amino acid to a different one. If this amino acid is crucial for the activity of the protein, the protein will no longer function. In some special cases, small mutations can be beneficial and allow the organism to better survive and reproduce in that environment. Mutations come in all shapes and sizes. These are discussed in detail in the article “Types of mutations”. As a quick summary, mutations can be a result of a change of one nucleotide, which could substitute for another nucleotide, could be deleted altogether, or a new nucleotide could be inserted. Mutations at a larger scale of chromosomes can also occur when whole sequences of DNA are deleted, inserted or inverted. This can include large structural changes, such as chromosomal translocations, where a large part of one chromosome becomes attached to another. The effects of these mutations are largely dependent on the location in which they occur and the gene or regulatory region that is impacted. Smaller mutations might seem like they could be less important than larger mutations, but this is not always the case. Mutations that are caused by a change of one nucleotide for another that are common in the population and not directly associated with disease are called Single Nucleotide Polymorphisms. (SNP). These SNPs are important markers for population geneticists looking at the genetic influences on certain traits and diseases. They are often commonly used as markers in DNA tests, like the ones available to buy such as 23andme and AncestryDNA. Mutations generally are thought of as a negative thing. However, mutations are absolutely essential for evolution to take place. A mutation that causes an individual to be healthier, stronger and have better reproductive success is more likely to become more frequent in the population over time. This does not happen quickly and is unlikely to be the result of a single variant. The accumulation of mutations that cause small effects on fitness increase the diversity and the adaptation of the species over time.